Standing on the southeastern side of Australia's Queensland, the city of Brisbane has long been the state capital and the country's third-biggest city. 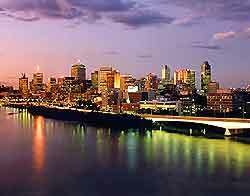 With a modern vibe and cosmopolitan character, Brisbane is an animated city and travellers are always welcomed. Found in 1824, Brisbane is a harbour city and offers important connections to the port network in Australia. Famed for its fine weather, glorious sandy beaches and attractive coastline, the aptly named 'Surfers' Paradise' shoreline is just a short trip from Brisbane.